Hello Trinity friends!! Brenda here with you today. Are you getting excited for the new winter release? All of the new products are available tomorrow!! Plus, there’s a huge blog hop starting tomorrow!! It is so BIG that it had to be extended over two days!! So make sure you come back on Friday & Monday!! How fun is that? Let’s get to my card for today, shall we? 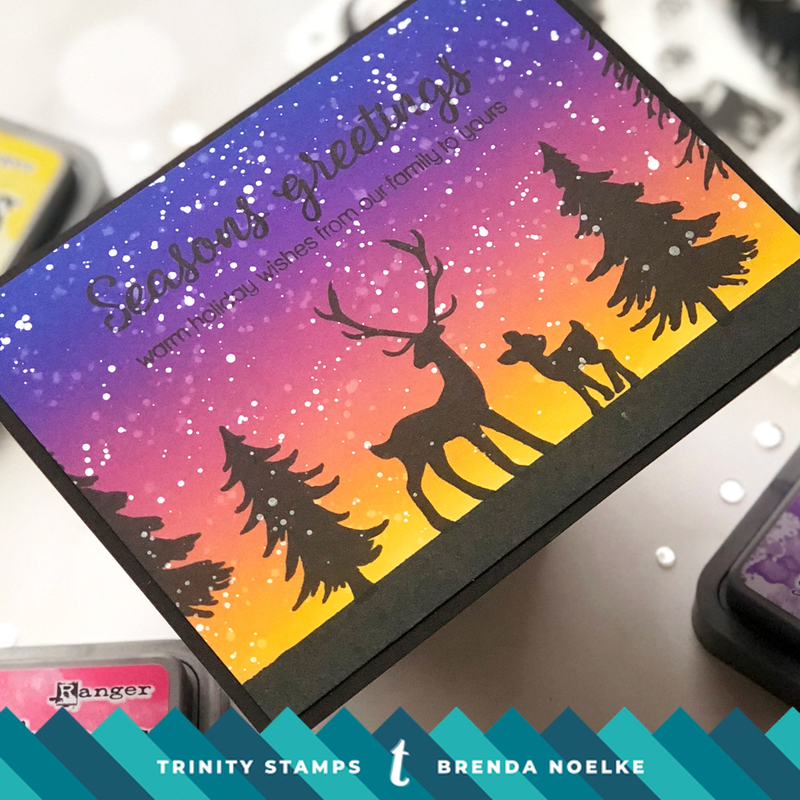 I love everything about the new Seasons Greetings Silhouette stamp set!! 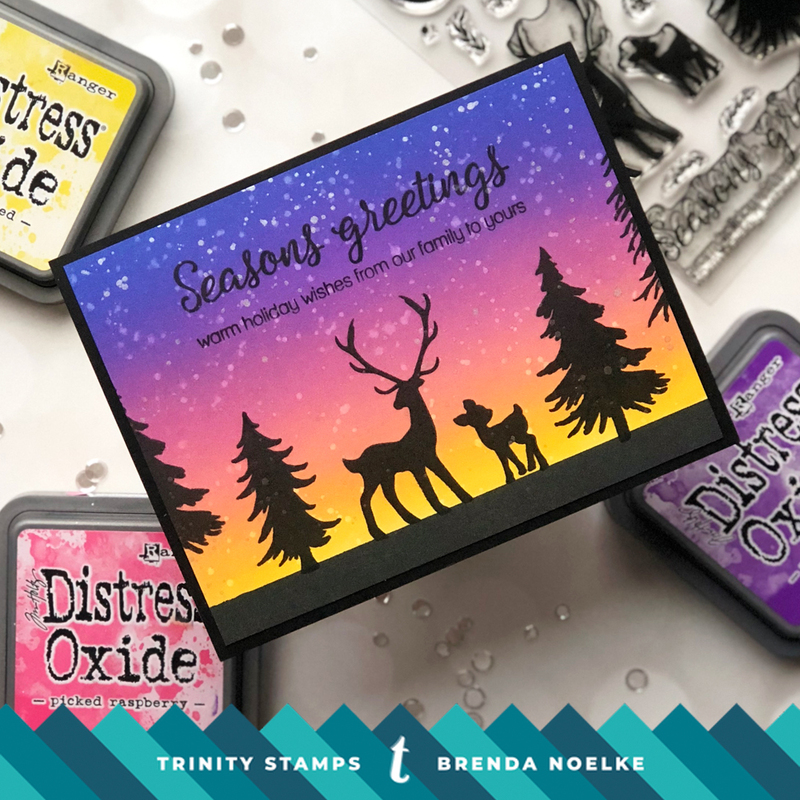 The buck, the fawn, the trees…everything!! I started off by ink-blending Distress Oxide Inks onto a panel of Bristol cardstock. I used Blueprint Sketch, Wilted Violet, Picked Raspberry, Worn Lipstick, and Mustard Seed for the sunset sky. I splattered the panel with water and picked up the excess with a paper towel. Next, I mixed a little bit of Perfect Pearls with some water and splattered that onto the panel. After that was completely dry, I taped off the bottom and added Black Soot Distress Oxide to create the ground. 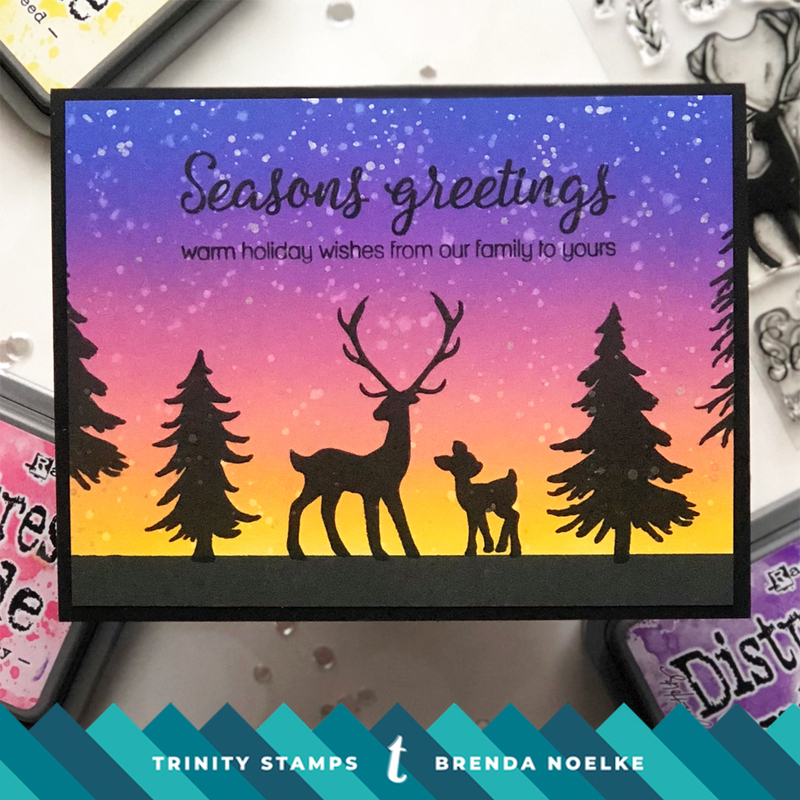 I stamped the images and sentiment from the Seasons Greetings Silhouette set onto the panel with Versafine Onyx Black Ink. I trimmed the panel slightly and adhered it onto an A2 size piece of black cardstock, then an A2 cardbase. Easy peasy…but the dramatic silhouettes create a stunning impact against the sunset background! Be sure to come back tomorrow & Monday for the hop!! Do you have a favorite from the new release yet? What’s on your wishlist?